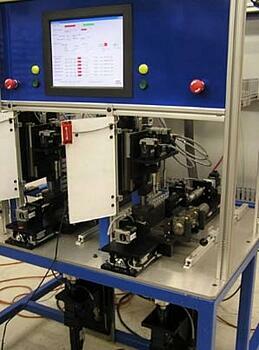 Fully automated test stand and adjustment table for high-end hydraulically controlled door closer device. Custom designed to adhere to National Fire Code specifications, and to allow full verfication and final adjustment prior to shipping. Table operates 12 stepper and servo motors on 4-axis of motion, and provides integrated torque and position instrumentation. All mechanical, controls, electronic, weldment, software, and PLC coding implemented by Ball Systems. Contact us today to learn about how we can help you with your engineering challenges. Ball Systems designs, develops, and delivers custom test systems and produces comprehensive build-to-print systems for companies creating or manufacturing critical electronic or electro-mechanical components for automotive, aerospace and defense and consumer appliance applications.